Alex Jones, radio host, conspiracy theorist and creator of the website Infowars, speaks to members of the media outside a Senate intelligence committee hearing on Wednesday. And Florida Sen. Marco Rubio tussled with conspiracy theorist Alex Jones after Jones confronted and touched him outside a Senate intelligence committee hearing. Jones interrupted Rubio as he was being interviewed by a scrum of reporters outside a room where the intelligence committee was hearing from Dorsey and Facebook Chief Operating Officer Sheryl Sandberg. 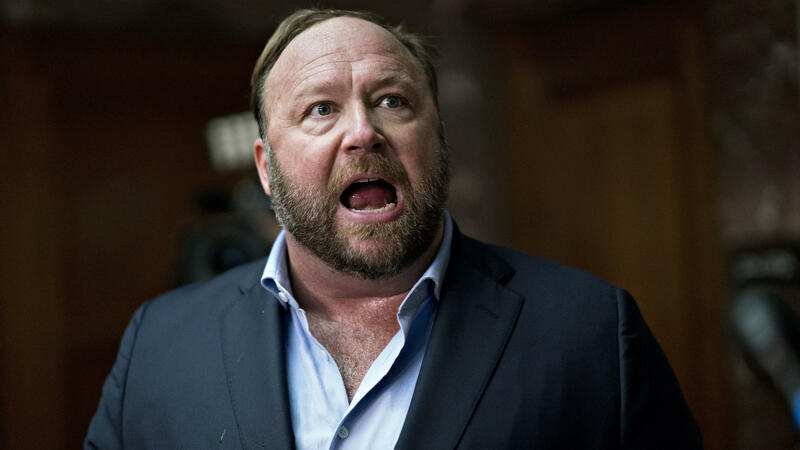 Jones says Democrats are behind the broader efforts in the tech world to censor programming in which he spouts a range of debunked theories. He says Republicans like Rubio are pretending the unfair censorship "doesn't exist." On Wednesday, as Rubio was answering questions from journalists, Jones raised his voice to call the senator a "frat boy" and said he was a "snake," before patronizingly patting him on his shoulder. A security officer warned Jones not to touch Rubio before the senator turned to him. "Hey, don't touch me again, man," Rubio said. "I'm asking you not to touch me." "Well, I just patted you nicely," Jones said. "Well, I don't want to be touched — I don't know who you are," Rubio said. Jones asked if he was going to be arrested, to which Rubio responded: "You're not going to get arrested, man. You're not going to get arrested. I'll take care of you myself." Jones seemed to relish in the confrontation, asking if Rubio was going to beat him up. "I didn't say that," Rubio said. Rubio then started laughing and turned away as Jones called him a "little gangster thug." Jones turned to a person filming the interaction and said "Rubio just threatened to physically take care of me." Rubio answered one more reporter's question, as Jones yelled next to him, before leaving the scrum. Throughout the interaction, Rubio repeatedly claimed he didn't know who Jones was and said he didn't read his website. Jones is at the center of a political dispute over freedom of speech that continues playing out in Congress this week. Facebook, YouTube, Apple and Spotify have all made moves in recent months to remove content posted by Jones. "At a time when these same platforms have said that they will try to winnow out fake news, hoax news, they've been hard pressed to explain why they've allowed Jones to continue to operate," as NPR's David Folkenflik said last month. Texas Republican Sen. Ted Cruz invoked a warning associated with the early days of the Holocaust in suggesting that what he called the suppression of Jones was the beginning of a slippery slope toward the suppression of other political speech. Republicans, conservatives and President Trump have focused their comments on other examples of what they call suppression of conservative voices by Big Tech. They point to "shadow-banning" on Twitter that they say disproportionately silences conservatives and to Facebook's suspension of certain accounts, including those of Trump supporters Diamond and Silk. 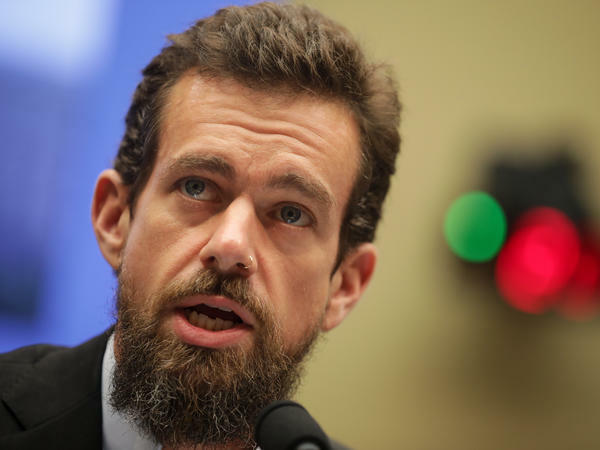 The tech companies deny any systemic bias, but on Wednesday afternoon, Dorsey was put on the defensive by House Republicans. They echoed the complaints by Trump that he and other people on the political right are treated unfairly. "We wouldn't be having this discussion if there wasn't a general agreement that your company has discriminated against conservatives," said Rep. Joe Barton, R-Texas. Dorsey live-tweeted his opening statement and explicitly denied any allegation of political selectivity by his company. "Looking at the data, we analyzed tweets sent by all members of the House and Senate, and found no statistically significant difference between the number of times a tweet by a Democrat is viewed versus a Republican, even after our ranking and filtering of tweets has been applied," Dorsey said. Democrats railed against Republicans for what they called political grandstanding and distracting from real issues with Twitter and other social media companies. Rep. John Sarbanes, D-Md., called the bias issue a "charade," while Rep. Mike Doyle, D-Pa., called it a "load of crap." "President Trump and many Republicans have peddled conspiracy theories about Twitter and other social media platforms to whip up their base and fundraise," said New Jersey Rep. Frank Pallone, the Democratic ranking member on the committee. There is likely to be more investigation and public comment: Attorney General Jeff Sessions cited the Senate hearing on Wednesday in announcing that he intends to meet with state attorneys general to discuss bias. Big Tech is caught between living up to its professed commitments to deliver open platforms and pressure from Congress to crack down on the circulation of false information — but do so in a measured manner that doesn't produce unintended consequences. "I want to start by making something clear: We don't consider political viewpoints, perspectives, or party affiliation in any of our policies or enforcement decisions. Period," Dorsey said Wednesday. "Impartiality is our guiding principle."